Wedding Guidebook — Love Stories Co.
YOU DESERVE AMAZING WEDDING PHOTOS. In this guidebook, we’ll cover everything you need to know so you can feel confident that you’re setting up your wedding day and photographer (therefore, your wedding photos) for success. Whether you’re a bride-to-be, groom-to-be, maid-of-honor, day-of coordinator or a momma looking to help the day go as smoothly as possible, feel free to use this information in order to help your photographer create beautiful wedding day images. So grab a cup of coffee (or let’s be real.. glass of wine) and let’s dig in together. Getting ready photos are easily some of our favorite moments to capture, but sometimes the energy is ruined by the aesthetic and not-so-ideal lighting conditions. A cluttered, messy, and dark room takes away from the genuine moments happening and the beauty of the morning. Clutter: Those beautiful, emotion-filled moments on the morning of a wedding day can be a little less beautiful with fast food leftovers, gym bags and a pile of shoes in the background. When it comes to making the most of your getting ready photos, it’s important that your getting ready location is as clean as possible when I arrive! Try your best to keep bags, suitcases, laundry, etc in a different room or the closet. Lighting: Window light is our favorite light. If possible, get ready in a room with lots of window light, where we won’t need to use lamps or artificial light. We prefer to turn off all the lights in the space you’re getting ready. This may seem counterintuitive, but working with the cleanest lighting possible will make your photos turn out best! This means no orangey hues from lamps and room lighting. Hair + Makeup: While most of the time we will arrive towards the end of hair + makeup, we still want these photos to look their best. If possible, try to get your hair + makeup done near a window. Natural light for both your photographer and your MUA is very important! Consider getting ready together: Some of the sweetest moments we’ve captured on wedding and elopement days are when the couple chose to get ready together the morning of their wedding. Sharing all the laughs and excited anticipation of the day. Just the two of you in a beautiful space preparing to commit your lives together. Details: While most of our work emphasizes the relationships and moments on your wedding day, we don’t want to leave out all the pretty details that help tell the story of your day. When we arrive where you are getting ready, it would be great to have some of those special touches ready to be photographed! You definitely don’t need to have a slew of details, but having some loose florals, the rings, an invitation or anything else you’d like documented ready will make it easy for us to capture the details along with all the excitement of the morning. Don't forget about the groom, if there is one! For some reason, sometimes guys get left with the dark tiny room. He is just as important, and his photos will look way better in a well lit room. Typical hotel rooms often don’t provide the best light or setting for prep. If you can, I recommend looking into other options, like a well lit Airbnb. There are tons of affordable cute ones out there, usually less expensive than a hotel! Groomsmen typically take a lot less time to get ready, so it's nice to send the second shooter (if you have one) along to any pre-wedding festivities: arcade, golf, to play pool, to a bar, etc. 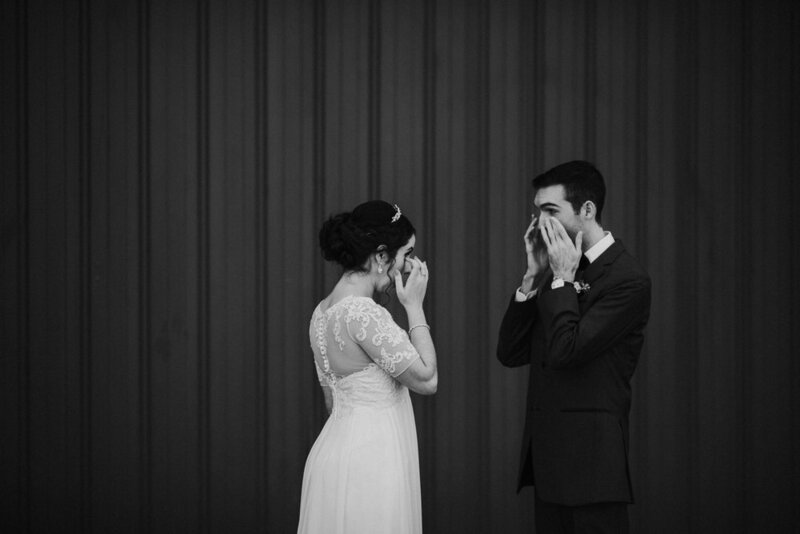 A first look gives you and your love a chance to see each other in a private, intimate setting before the ceremony. It takes the pressure off. There’s often a LOT of nerves going into your ceremony. We believe much of that is the anticipation of seeing your soon-to-be spouse for the first time! But if you have a chance to see them for the first time in a quiet, intimate setting before the ceremony, chances are you’ll be MUCH more relaxed when ceremony time comes! You’ll have better photos. While I do love the groom reaction shots while a bride walks down the aisle, it’s far less intimate than a first look and we aren’t able to capture the emotion as well as if you took some time aside for the two of you! It’s also a lot harder to take in the moment for yourselves when there’s dozens of people watching you! It frees up your timeline. Yep! Usually after a first look, we’ll do family photos prior to the ceremony. This means you won’t have to spend time doing family photos after all the excitement of the ceremony and you’ll be able to spend even more time with family and friends during cocktail hour and the reception! We’ll still grab you for sunset portraits at some point depending on when your ceremony is, but more time at the reception is a win for everyone. In the end, I say do what you have always envisioned. If you've always pictured not seeing your significant other that day until you meet at the alter, go with your heart! We actually opted out of a first look for our own wedding, because that's just what we always imagined. While the majority of the day is focused on capturing emotion and unplanned moments, we realize that family photos are just as important and we take them very seriously. We recommend limiting to 10 family formal groupings. We know it can sometimes be difficult to get your list down to 10 groups, however, we’d encourage you to think about which arrangements are most important to you and stick with no more than 10 groupings. Family photos are often the most exhausting portion of the day, and instead of tiring yourselves out with dozens of family groupings, we recommend allowing for more time with family during cocktail hour and reception while we capture all the candid moments along the way. Group photos should be done prior to the ceremony (if a first look is involved) or immediately after the ceremony (get the officiant to make an announcement for all family + bridal party to stay put). Corralling everyone during cocktail hour is often difficult. Grandma is likely to get lost in the crowd and it’s easy for the best man to find himself at the bar instead of lining up for bridal party photos. This corralling can really eat into the time we have for portraits and for you to enjoy your reception! please also send us a list for family photos including first names so that we can mark each grouping off the list. You’ve spent hours planning the PERFECT ceremony. However, you may soon realize your planning efforts were a waste when your ceremony photos weren't how you imagined in your head. When planning your ceremony location, it’s easy to get caught up in the location and views and disregard the lighting, but the lighting will play the biggest role in how your photos will turn out! Backlight: This is especially important if you must have a midday ceremony. This means setting up your ceremony so the sun is behind you, your fiance, and your officiant, and your guests are facing the sun. If your ceremony is in the afternoon or close to sunset, your guests should be facing West (towards the sunset). For morning ceremonies, your guests should be facing East (towards the sunrise). Sunset is best: With few exceptions, we plan portrait sessions and bride and groom photos right before sunset because the lighting is most beautiful that time of day! It’s softer, golden and straight up gorgeous. That same light is just as important for your outdoor ceremony. We recommend doing outdoor ceremonies about 2 hours prior to sunset allowing time for bride + groom photos as well as potential delays + timeline emergencies. Everyone, including the guests, are evenly lit because the sun is lower. Sadly: the groom's face is blown out and too bright while the bride's face is in even lighting. The background is spotty and uneven. At the alter, the groom was sweaty and squinting the entire time while the bride was in a shadow. Try your best to find a venue with a lot of natural light. When you depend on artificial lighting, it's often very uneven and creates very unflattering colors on your skin (making you either look very very pale or very orange). Below is a great example of a well lit indoor ceremony. If you are unsure, don't hesitate to ask us about your ceremony timing! Even if you're planning on having a first look, we prefer to do your couples portraits about one hour before the sun sets, after your ceremony. This is because of the emotion / mood + the lighting / aesthetic. It's so much easier to capture that excited "YAY! We just got married!" feeling, rather than trying to photograph you two when you may have some nerves about the ceremony approaching. It's difficult to relax when you're thinking about standing up in front of a lot of people, thinking about reciting your vows properly, and stressing about the timeline. As far as lighting goes, I won’t get too scientific (because let’s be real..that's not my specialty), but the closer the sun gets to the horizon, the more diffused the light gets. Essentially, all the sunlight gets filtered through little particles in the air making it “softer,” which is why many photos are most beautiful at sunset! There’s less harsh shadows and the light is much more flattering on both your skin and the landscape around you. We recommend arranging your timeline first and foremost around beautiful light for your these portraits, because these are most likely the photos you'll end up displaying around your home. We like to plan for 45 minutes for photos, but the more time you give me for bride and groom photos, the better your photos will be and the more you’ll receive! In the end, how much time we spend on each aspect of the day is ultimately up to you! As you know, capturing the mood of your event is very important to us. This is why we don’t use flash for anything other than party/ dance floor time. For a romantic mood, edison bulbs / string lights and candles are great, and if you use enough they provide great light for photos. The photo above was shot about an hour after sunset! Just try to be sure there's enough lighting. If you want a moody vibe with candles, be sure there are plenty. Not having enough light will make focusing trickier for us and you’ll have less usable photos. We can of course use our flashes, but we like to save those for the less formals dances and events, so that we aren't distracting any moments. If you’re unsure about your setup, just ask us and we’ll help! DJ Lights: While colored/flashy lights that your DJ provides might be fun for party time, they can destroy the romantic mood of your first dance, other special dances and toasts. If your skin looks blue, yellow, or whatever random color your DJ happens to throw on, we will more than likely have to turn those photos to black + white. If you are having colorful lights, we ask that they be turned off during those important moments. For party time, go crazy with them if you want! One last word on receptions: please feed your photographer! Most wedding days are at least 7 hours. Besides getting straight up hangry during that time, a malnourished photographer is not a creative one. We plan to eat right when dinner begins, that way we aren't still eating when it’s time for toasts and whatnot! Some caterers insist on serving all vendors at the end of the meal, so please make sure you speak to your caterer about this so we don’t miss anything important! To give you a better idea of what that looks like, we’ve put together a sample timeline. We’ve also noted the sunset time so you’re able to see how the sunset plays a leading role in the timeline and the rest falls into place around it. This timeline includes a first look and is based on 8 hour coverage from 2pm to 10pm. If you have any questions while putting together your timeline, please don’t hesitate to reach out!! Love Stories Co. would love to help you plan out your day to allow for a stress free day and beautiful photos!